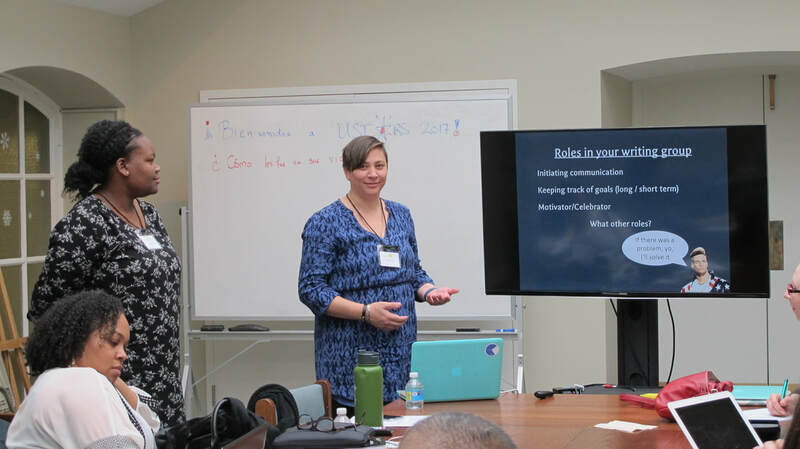 Prior to USTARS 2017, a few early career faculty came together for a pre-conference workshop. Speakers Dr. Alejandra Alvarado of Eastern Illinois University, Dr. Shannon Talbott of Moravian College, Drs. Candice Price and Amanda Ruiz of University of San Diego, Dr. Erik Insko of Florida Gulf Coast University, and Dr. Dandrielle Lewis of University of Wisconsin, Eau Claire discussed how to navigate through the writing requirements and expectations of academia. Several early career faculty were invited to participate in a pre-conference workshop prior to USTARS 2016. Speakers Dr. Kimberly Kendricks of University of Nevada, Las Vegas, Dr. Ulrica Wilson of Morehouse College, Dr. Dennis Davenport of Howard University, and Dr. Rebecca Garcia and Dr. Brian Loft of Sam Houston State University led discussions regarding research with undergraduates, Click the links below to revisit some of the slides and worksheets examined. Participants of USTARS 2016 pre-conference workshop.